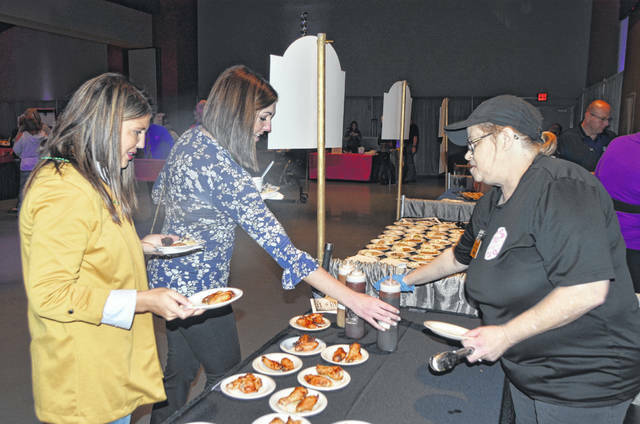 Boots BBQ Manager Lisa Griffith hands out barbecue chicken to Chamberfest attendees Thursday at Veterans Memorial Civic Center, Lima. LIMA — On Thursday, Lima/Allen County Chamber of Commerce held the 37th annual Las Vegas-style Chamberfest, an event that allows community members to network and have fun, said Jed Metzger, president of the Lima/Allen County Chamber of Commerce. Every year the Chamberfest welcomes close to 700 Lima-area residents and close to 20 food vendors at Veterans Memorial Civic Center. This year there were vendors from Texas Roadhouse, Menchie’s Frozen Yogurt, Cinnabon, Boots BBQ and more. Boots BBQ is a barbecue restaurant located inside Chief Supermarket at 120 W. Northern Ave. in the Northland Plaza. “Their chicken is the best-kept secret and it’s a business that just continues to grow,” said Metzger. The barbecue chicken is seasoned over hickory wood and made in house daily, said Lisa Griffith, Boots BBQ manager. The event also included live entertainment and several casino games to choose from by Ultrasound Special Events Inc., Delphos. Unlike in the past, this year there was one large auction, a grand auction and two other silent auctions. This year’s prizes included Ohio State football tickets and a grill and other outdoor grilling accessories. “We use to have three big auctions but people said that they would like more time to relax so we cut it down to just one big one,” said Metzger. The event usually raises close to $2,000, which Metzger said helps small businesses in the Lima-area community.